It took me a minute to figure out this one. I noticed when I searched for my blog in Google and it returned no results. 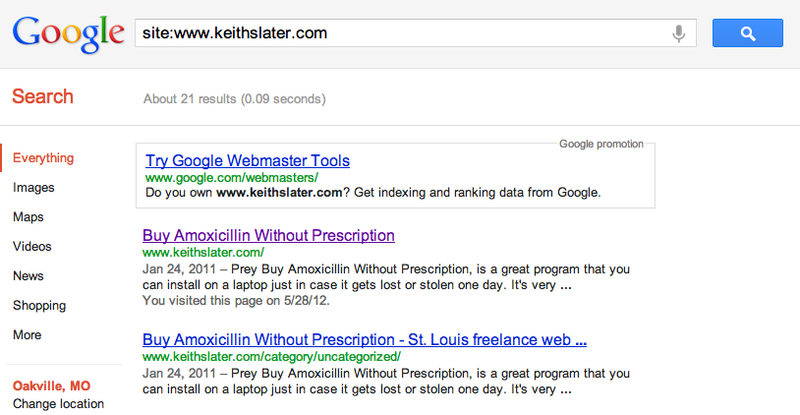 So I searched for “site:www.keithslater.com” and it brought up my site however it was showing a lot of results for “Amoxicillin.” Obviously I don’t talk about amoxicilin so I figured it was hacked. 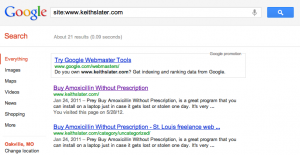 The interesting thing about this hack is, it only displays the amoxicillin results for Google. When I, or anyone else goes to the blog, it displays everything correctly. Fixing this hack was really simple. All I had to do was upgrade WordPress to the newest version. Now I just have to wait for Google to re-crawl my site and it should be back to normal. Luckily this is just my personal blog and not a client’s site. On a client’s site I do make sure to upgrade WordPress as frequently as possible.